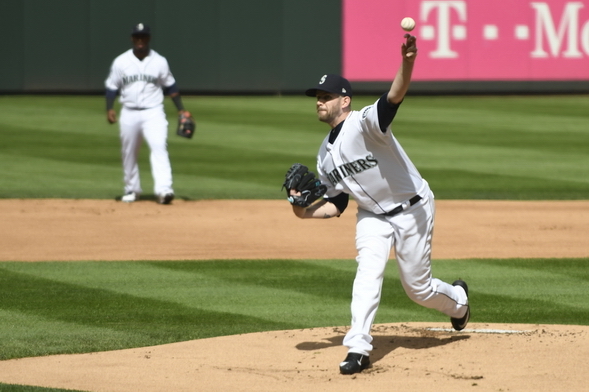 Three hits from Nelson Cruz and a four-hit shutout over seven innings from starter James Paxton gave the Mariners a 6-0 win that drained the impact of the Sunday debacle in Anaheim. Under no circumstances is it permissible for baseball fans to jump off a figurative bridge over a bad first week in April of a 162-game season. There is, however, no prohibition against booing the crap out of a 1-6 team that loads the bases with none out in a scoreless game and gets no runs. That’s what many in the announced crowd of 44,856 did in the fourth inning of the Mariners’ home opener Monday afternoon. Fortunately for the Mariners, by the seventh inning, they were up 6-0 and fans were skipping tra-la, tra-la through fields of daffodils and tulips. Well, not really, but exaggerating single wins is as traditional as invoking 40 years of mediocre history to explain the Mariners’ bad week. They are 2-6, same as a year ago when they reached 86 wins and the outskirts of contention. Not that this is an epochal achievement, but coming off Sunday’s loss in Anaheim that was indeed at the 40-year frontier of wretchedness, any sort of weasely little win Monday would have been an elixir from the heavens. But the 6-0 outcome was dominant against a good Astros team that took three of four in Houston last week. Starting pitching, relief pitching, offense, defense — all boxes checked. No residual damage was apparent from blowing a 9-3, ninth-inning lead and losing to the Angels 10-9, leaving a scar visible from Earth orbit. “I walked in this morning and treated it like Opening Day — start over,” said Mariners manager Scott Servais, adopting the brainwash technique. “It was a rough week, no doubt. Everybody felt it. It developed that it becomes very hard to lose when the starting pitcher has a four-hit shutout through seven innings. James Paxton was everything the Mariners had hoped for him since he first arrived in the bigs in 2014 — dominant fastball, curve ball that was a strikeout pitch, calm as a napping kitten. It was a repeat of his victory last week in Houston, a six-inning, two-hit shutout. Big change from a year ago. In 2016 Paxton had such a poor spring that Servais left him at Class AAA until June 1. That looks now like a long time ago, in the view of Astros manager A.J. Hinch. Stress came after Paxton left when the Astros loaded the bases with one out against reliever Dan Altavilla with two hits and a walk. Servais admitted that the irony of another late-inning, six-run lead was immediate and disturbing. But Carlos Correa struck out and Carlos Beltran popped out, sending the nightmare back into its closet. Besides Paxton, the other bit of encouragement was 15 runs in the past two games, which Sunday included a bases-loaded single in the fifth inning by DH Nelson Cruz, who boosted his average nearly 100 points to .172 with three hits. It was so much healthier than giving fans a stroke. Or a desire to leap off a bridge. SS Jean Segura left the game in the fourth inning with a hamstring strain that Servais termed “very mild, ” and said it would not require a trip to the disabled list. The Mariners’ lone backup infielder, Taylor Motter, replaced him . . . When 2B Robinson Cano fouled a ball off his foot, Servais blanched, fearing a makeshift infield that would include use of 38-year-old backup C Carlos Ruiz “somewhere in the infield,” Servais said. But Cano shook off the pain, drew a walk and finished the game. Servais thought Cano would be able to play in Tuesday’s second game of the three-game series. Hurray the season is here. Baseball is such a good relaxing listen on the car radio. And, there are so many side stores like learning the new names, seeing who sticks, the player churn before mid-season, injury and not quite right reports, and which opponents are better or worse. Analyzing analytics is the new thing. Those pesky discrete events make up statistics and not the other way around (someone has to hit the damn ball). Yesterday’s win counts the same as any win in September. Mariners: 86 wins. But 86 probably won’t make the playoffs. You good with that? I survived last year and all of the years before. It’s better to be a casual fan. Enjoyed the baseball years in the PNW except the time I almost froze to death watching the Pilots at Sick’s stadium.